We look forward to welcoming you inside our inviting reception area, where you’ll immediately feel the warm hospitality of the Bernardi family. 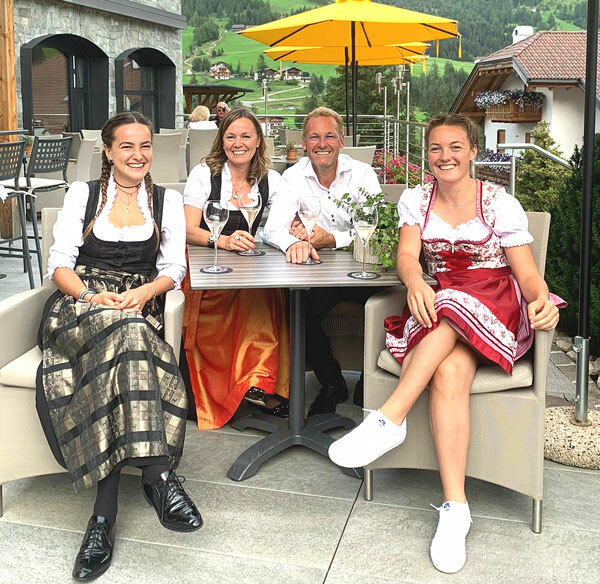 Enjoy the relaxing atmosphere in our lounge bar, or on our sun deck with its fabulous views of the Dolomites and Gran Risa, and treat yourself to a delicious drink. We'll be happy to serve your breakfast and lunch on this same deck. The hotel also features a TV room for movie nights and good company. Kids, too, will get a feel for the first-rate treatment on offer at the Hotel Ciasa Soleil in Stern La Villa, where a large playroom and adventurous playground await. Kids are always looking for something new...Our playroom is the perfect place for both children and adults alike, and features ping-pong, foosball, a play and painting corner. The playground is located directly in front of the hotel entrance. Guests are free to store their skis in a video-monitored room that can only be accessed with a key card. This room contains a series of cabinets (one per hotel room) with built-in ski boot dryers. During the summer, the room can be used to store bicycles. Guests arriving by car can park in a secure underground garage or covered parking lot.